Fennel is used quite a bit in Italian cooking, and it compliments roast fowl very well. Roasting a duck isn’t hard, or scary, or overly messy (if your roasting pan is big enough to catch the grease, and the splatters). And fennel is a great flavor to play around with. Combine the ingredients of the rub in a small bowl, then massage the rub all over the bird and let it stand at room temperature for at least 1 hour, or refrigerate over night. Place the fruit and garlic inside the duck and place on a roasting rack. 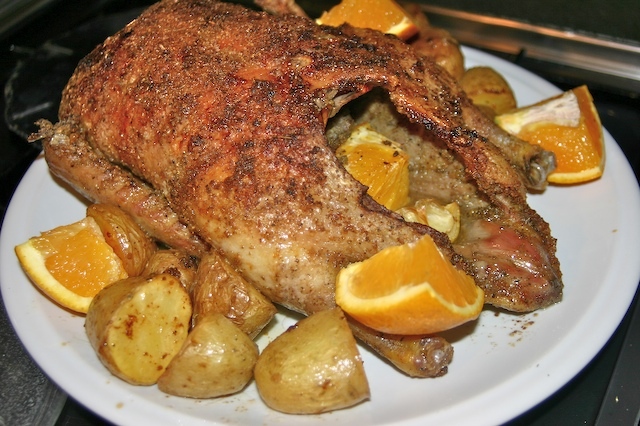 Take some washed and halved potatoes and place underneath the duck. Roast the duck for 10 minutes at 425, then reduce the heat and roast at 350 for about an hour. There are a few ways to check if the duck is cooked. Use a thermometer, the inside temperature should be 165 degrees F, which takes about 30-35 minutes per pound. Tip the bird and be sure the juices that come out are clear, not bloody, this method is not as reliable as the thermometer, but it’s a good rule of thumb for all fowl. Serve with some quartered oranges to squeeze onto the meat, and the roasted potatoes. And if Amos is coming for dinner….make extra potatoes!